If your company has a requirement for I.T. equipment, whether desktop PCs, notebooks, networking or peripheral devices, talk to us and we'll do our best to beat any quote you have had so far. From a simple office printer to a complete network of workstations, we can provide your business with the very latest technology at hard-to-beat prices. with Flat Screen TFT Monitor and cordless keyboard and mouse. 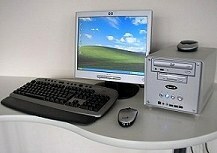 We supply systems from respected manufacturers such as HP/Compaq, Fujitsu-Siemens, Acer and IBM. We source the solution to match your exact requirements, with your choice of hardware and software. Depending on your needs, we can usually provide next business day delivery, too. As prices change from day to day, call or e-mail us for the latest deals! For a fast-track PC quote, call us on 01293 434224, or e-mail us by clicking here. Desktop PCs, Notebook PCs, Monitors, Printers, Scanners, Network Hardware, PC Components, WebCams, Digital Cameras, CDs, Cables, Office Equipment, Test Equipment & Tools.